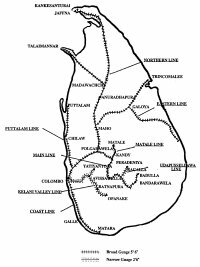 The first railways were not built until 1865 (Colombo to Ambepussa) as part of the Colombo - Kandy Line. After this the building continued until there was a system which covered over a thousand miles. All the railways are state owned and the predominant gauge is 5'6", however there are also narrow gauge lines of 2'6". 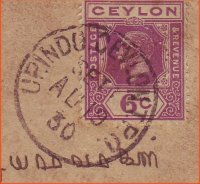 Mails were conveyed from the 1st January 1867 between Colombo and Ambepussa and manuscript markings survive from this period. 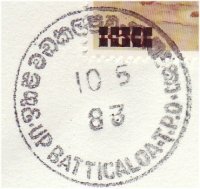 The introduction of Travelling Post Offices to Ceylon (Sri Lanka) at the end of the 19th century was intimately related with the development of the Tea Industry on the Island. It was to satisfy the needs of up-country tea planters and their staff, to have the Colombo evening newspapers delivered as soon as possible, that the TPOs were introduced on probably 1st March 1892. Galle TPO - up and down. Since the tsunami this TPO has been lost. If you can add any more information, please get in touch. Source: The TPOs of Ceylon by Derek Walker published in 1990 by the Ceylon Study Circle.